A Japanese saying is "Food is meant to be eaten with the mouth and the eyes." Likewise, the best hot springs are multisensory. 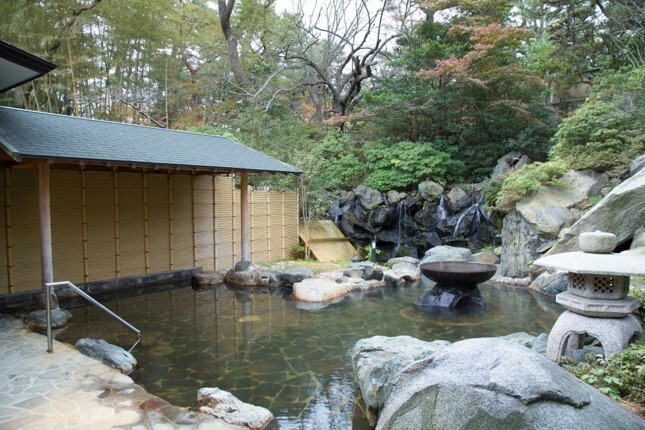 The hot spring baths at the Itsuura Kanko Hotel pleasure and relax the eyes, ears, nose, skin, and heart. The Itsuura Kanko Hotel is perched on a cliff above the Izura Coastline of Kita-Ibaraki. From the baths, sea- and skyscapes are visible. Watch the colors of water and light play and dance while you are warm and comfortable. Since all of the baths are close to the sea, the sounds of waves, wind, and birds roll over you as you bathe. The feeling is akin to an auditory massage that melts stress away. The Izura Coastline was selected by the Japanese government for inclusion in a list of the best 100 soundscapes within Japan. You'll find yourself breathing slowly and deeply, a feeling that comes when you are miles away from the hassles of life. Breezes off the ocean, carrying traces of the salty sea, linger around the baths before disapating into the atmosphere. Under the soothing influence of the natural onsen water, you'll experience your skin becoming smoother and more sensitive. High-quality food, service, and excellent baths enrich the hearts of visitors. I stayed just one night, but I wished that I could have stayed longer. The Itsuura Kanko Hotel in located in Kita-Ibaraki, which is barely visited by foreigners. My friends and I were probably the only Westerners enjoying the facilities that night. If fine service and Japanese traditional luxurious surroundings are what you want, I recommend this hotel. Kita-Ibaraki seems a wonderful place! Yes. It is a wonderful place that few foreign tourists know about. I highly recommend visiting.